From Academy Award-winning director Ron Howard comes the electrifying, untold story behind one of the most unforgettable moments in history. When disgraced President Richard Nixon agreed to an interview with jet-setting television personality, David Frost, he thought he’d found the key to saving his tarnished legacy. But, with a name to make and a reputation to overcome, Frost became one of Nixon’s most formidable adversaries and engaged the leader in a charged battle of wits that changed the face of politics forever. Featuring brilliant portrayals by Frank Langella and Michael Sheen, Frost/Nixon is the fascinating and suspenseful story of truth, accountability, secrets and lies. $180.708 thousand on 3 screens. A television interview doesn’t sound like the material of which feature films are made, but one becomes the focus of 2008’s Frost/Nixon. 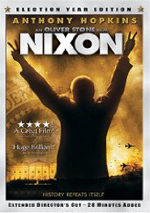 Adapted from a successful stage play, the film starts in 1974 with the resignation of President Richard M. Nixon (Frank Langella). TV host David Frost (Michael Sheen) sees this and decides he wants to land a much-coveted interview with the former president. 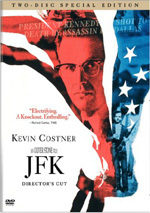 Thus starts Frost’s path to his confrontation with Nixon. No one expects more than a puff piece from Frost, but he’s determined to exact a confession from the disgraced former president. In addition to longtime producer John Birt (Matthew MacFadyen), Frost works with researchers James Reston, Jr. (Sam Rockwell) and Bob Zelnick (Oliver Platt) to dig into his subject as much as possible. The film follows Frost’s side of things as it builds toward the climactic interview in 1977. Never underestimate Ron Howard’s ability to take the best material and make it mediocre. Howard defines the phrase “jack of all trades”; rather than specialize in any particular genre, he’s touched on a wide variety of subjects over the years. On paper, that sounds admirable, but in reality, it simply denotes an overreaching sense of ambition. Howard’s talents probably lie best in the light comedic fare via which he made his name as an actor; when he aspires to more serious drama or other genres alien to him, he tends to lose his way. Howard takes the confrontational drama of the original stage play and makes it rather bland and plodding. A few months after I saw the film, I took in the live production. Though the acting wasn’t as good, the piece nonetheless worked much better. And this from someone who much prefers film to live theater; even with that bias, I felt the stage Frost/Nixon had a certain urgency and sizzle largely missing in the movie. Not that Howard doesn’t attempt to give the flick a sense of immediacy. Unfortunately, he just relies on stock techniques. Like apparently every other filmmaker these days, Howard embraces the cheap “documentary” feel of the handheld camera. This rarely adds to movies, and it fails here. Rather than allow the material to develop its own sense of drama, the camerawork distracts us. It does the opposite of what it wants to do. Because Howard lacks any real creative impulses, though, I guess this is the best he can do. Which is a shame, since the subject matter possesses great potential – and the stage production largely achieves that potential. It shows a good sense of drama and pacing, neither of which appear in this plodding, lackadaisical telling. Howard allows the story to progress at such a leisurely stroll that it loses its tension and urgency. And it also wastes an excellent cast. Langella boasts virtually no resemblance to Nixon, but he channels the former president well. He doesn’t do a standard impersonation, but he adapts just enough of the standard Nixon voice and persona to allow us to suspend disbelief. Given our intimate familiarity with Nixon, that’s no mean feat, and that’s not all Langella accomplishes. He provides a good human sensibility about Nixon and never allows him to degenerate into simple caricature. Langella does very well in the role and elevates the material whenever he appears. Sheen gets the more thankless role as Frost, but he also does nicely. In some ways, Frost offers the more challenging personality. While Sheen doesn’t have to deal with as much historical baggage – or the same level of audience familiarity with the real deal, at least not here in America – he does get the less interesting character. Frost easily could become a glib cipher, and that’s often how he seems. In the case of Frost, one occasionally gets the sense that “there’s no there there”; he seems superficial and largely lacking in introspection. And I think that’s probably true of the real man, as I get the impression he much prefers to do the asking and not the answering. Despite the one-dimensional potential, Sheen manages to evoke Frost’s inner turmoil. He does so subtly and almost always keeps up Frost’s well-developed ability to always be “on” and charming. Sheen doesn’t give us a showy performance, but it’s a winning one. Too bad Langella, Sheen and the rest of the excellent cast don’t get much help from their director. 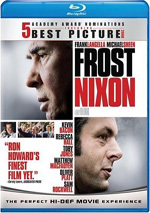 Frost/Nixon covers an interesting topic and remains watchable, but I don’t think that’s good enough. Ron Howard takes a fascinating subject and renders it generally inert in this mediocre telling. Frost/Nixon appears in an aspect ratio of approximately 2.35:1 on this Blu-ray Disc. Virtually no issues cropped up in this stellar transfer. With only one mild exception, sharpness looked excellent. During Frost’s chats with network executives, I noticed a brief soft shot. And that was it; otherwise the flick looked tremendously crisp and concise. Fine detail looked great, as even the widest shots demonstrated nice definition. No concerns with jagged edges or shimmering occurred, and edge enhancement was absent. Source flaws weren’t a problem, though some shots looked rather grainy. This was clearly a photographic choice, as the grain cropped up solely in the “modern day” interview sequences. I wasn’t wild about the grain, but I recognized it as a film decision, not a flaw. Frost/Nixon opted for a natural palette most of the time. Those modern interviews tended to be desaturated and cold, but the rest of the flick featured a good sense of color. These tones were consistently full and warm. Blacks appeared dark and dense, while shadows showed good clarity and smoothness. I felt quite impressed with this consistently attractive presentation. While not as impressive, the DTS-HD MA 5.1 soundtrack of Frost/Nixon suited the film. The soundfield remained restrained much of the time. A few scenes like those at airports added a little pizzazz, but these were in the minority. Instead, the movie usually went with a general sense of ambience. Nothing challenging occurred here, but the track felt appropriate. Audio quality satisfied. Speech was concise and natural, without edginess or other issues. Music appeared lively and full, and effects were pleasing. Those elements came across as accurate and distinctive, though they didn’t exactly tax my system. All of this was good enough for a “B-”. When we head to the set’s extras, we start with an audio commentary from director Ron Howard. He provides a running, screen-specific look at his involvement in the project and the adaptation of the play, facts and liberties, cast and performances, research, editing, and the use of archival footage, sets and locations, visual choices and effects, and music. For the first half of the film, Howard gives us a dynamic commentary. He throws out tons of good information and keeps us involved. During the flick’s second half, he starts to run out of steam. Actually, Howard still gives us plenty of useful notes, but we hit more dead air. Even with those issues, this remains a very good commentary. For something more interactive, we jump to U-Control. This allows two different programs that run along with the movie. The Nixon Chronicles acts as a minor form of text commentary. Its blurbs crop up periodically and tell us some facts about the film’s subjects. 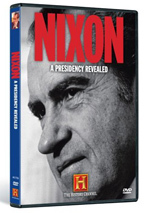 Despite its title, the “Chronicles” doesn’t stick solely with Nixon. It also provides a few biographical notes about Frost and the others, though it mostly tells us about Nixon, Watergate, and the like. In addition to the text, some video footage appears. For instance, shots of the Iran-Contra trial show up at the appropriate time, and we see a little of “The Checkers Speech” when that subject arises. The “Chronicles” doesn’t prove to be fascinating, but it adds some good details. “U-Control” also provides a Picture in Picture feature. This mixes interviews and behind the scenes footage. We get notes from Howard, producer Brian Grazer, Sir David Frost, James Reston, Jr., executive producer/screenwriter Peter Morgan, executive producer Todd Hallowell, and actors Frank Langella, Michael Sheen, Matthew MacFadyen, Toby Jones, Rebecca Hall, Sam Rockwell, Kevin Bacon, and Oliver Platt. The comments cover the play and the decision to bring it to the movie screen, script and adaptation issues, cast and performances, sets and locations, thoughts about the facts behind the movie’s characters and situations, historical information, and a few other production tidbits. While the “Chronicles” offers sporadic bits of information, “Picture in Picture” becomes a constant companion during the film. Once the first component appears, we get a non-stop series of segments that all blend into one seamless piece. Rather than just turn into the standard clip here or there, it really gives us a two-hour documentary about the film. Albeit not the most coherent documentary, as the segments follow the onscreen action. This means we jump from one topic to another without a lot of smoothness; the segments don’t bump into each other in a jolting manner, but they don’t blend in the way we’d expect from a more traditional program. Nonetheless, “Picture in Picture” proves quite valuable and enjoyable. Maybe I shouldn’t call it a documentary, as it’s not one in a pure sense. It’s probably closer to a video commentary, though the inclusion of many shots from the set makes it different than an ordinary track. Whatever you want to call it, I think it’s very good, as it offers two hours of useful information in a dynamic manner. 12 Deleted Scenes run a total of 30 minutes, 28 seconds. These include “More Details Prior to Resignation Speech” (2:15), “Resignation Speech” (2:29), “Frost Over Australia!” (1:28), “Nixon Farewell” (3:50), “Nixon Farewell (Video Version)” (3:50), “Frost/Bentley Car Phone” (2:38), “Swifty Wants His 10%” (0:56), “Extended 1st Cut – Research Montage” (4:14), “Mr. And Mrs. Nixon” (1:07), “David Schmoozes the Press” (1:25), “Nixon Pummels Frost” (2:32) and “Nixon Piano Solo” (1:29). Most of these scenes extend existing clips. Some do so better than others, and many are interesting just from the “curiosity” standpoint. The ones related to Nixon’s resignation fall into that category; in particular, the “Video Version” of the “Farewell” is the same as the prior “Farewell” except shot on tape. A few clips are pretty good, though. “Pummels” adds a little more to the sense that Frost couldn’t match up with Nixon, and “Schmoozes” shows Frost’s financial troubles. “Phone” doesn’t add much to the scene in which Frost pitches the Nixon interview to Birt. I like it just because it explains why the posh Frost is dining in a crummy cafeteria. Four featurettes follow. Discovering Secrets: The People and Places Behind the Story runs 13 minutes, 19 seconds and includes notes from Howard, Frost, Langella, director of photography Salvatore Totino, location owners Mr. and Mrs. Smith, and production designer Michael Corenblith. “Secrets” looks at research and the facts behind the movie’s portrayal. After the commentary and the “Picture in Picture” feature, we’ve already gone through a lot of info about the film. This means some repetition here, but some new perspectives bring out good details. For the 22-minute, 58-second The Making of Frost/Nixon, we hear from Howard, Langella, Sheen, Morgan, Grazer, Frost, MacFadyen, Platt, Rockwell, Bacon, Hallowell, Hall, Totino, Corenblith, and costume designer Daniel Orlandi. The show examines the play and its move to the screen, cast and performances, costumes, production design and period issues, and cinematography. Again, the disc’s other programs have covered so much territory that redundancy becomes inevitable. Happily, “Making” still throws out some good elements. In particular, I like the revelation that Langella remained in character on the set. A shorter featurette that focused solely on those unique bits would’ve been preferable, though. The Real Interview runs seven minutes, 28 seconds as it features Howard, Langella, Corenblith, Bacon, Reston, and Totino. This one looks at the actual 1977 interviews and attempts to recreate them. Some useful facts appear here, though I wish we’d gotten to see more of the footage from 1977. Finally, The Nixon Library goes for six minutes, 22 seconds and includes Howard, Nixon Library executive director John H. Taylor, and assistant executive director Kathy O’Connor. We learn a few interesting things about the site, but this is essentially just an ad for the Nixon Library. As a stage play, Frost/Nixon crackles. As a film, Frost/Nixon tends to plod. Despite some excellent performances from its top-notch case, the movie lacks urgency and fails to develop much forward momentum. The Blu-ray presents terrific picture quality, perfectly adequate audio, and an excellent collection of extras. I’m pleased with this top-notch release, but the movie itself disappoints.